Signup to receive special offers, upcoming events and more. Explore the Best of Hollywood. 3 Miles, 10 Minutes. Authentic cuisine, bars & unique stores. 2 Blocks, 10 Minutes Walk. Two of the coolest cities in Los Angeles. 1.5 Miles, 5 Minutes. Several major area hospitals nearby. Why wait in long lines and pay extra? Get your discount tickets online. When you book here: Get our best rate guaranteed. 10% instant savings & free breakfast. 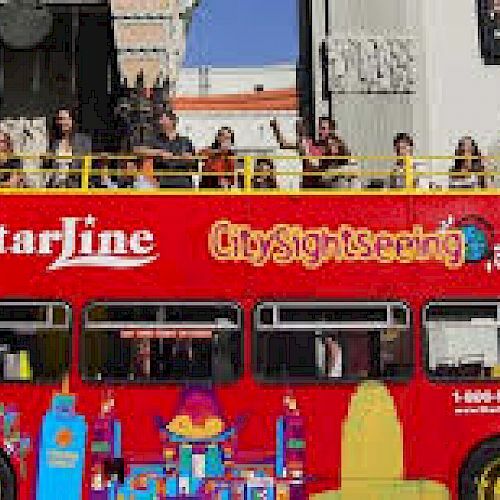 Starline Tours of Hollywood' provides the most exciting tours to discover greater Los Angeles. The daily Hollywood and Los Angeles tours are from 2 hours: Movie stars homes tour which departs every 1/2 hour, to all day tours like the Grand tour of Los Angeles or Los Angeles Tours by night. Starline gives you the opportunity to visit all the major attractions in California; Universal Studios, Disneyland, J.Paul Getty Museum, Knotts Berry farm and Sea World. We have many 'good value' packages which combine compatible tours and give you a very enjoyable hassle free day out. Starline, picks up and drops off, from most hotels in the greater Los Angeles area. The tours are fully commented by professional guides, in comfortable air conditioned coaches or mini-buses.